Family Values. Specialty Diet. Great Taste. 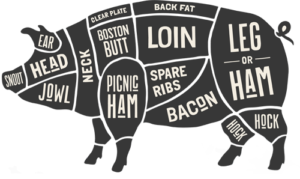 We carefully select hog lines with a focus on what will produce the best taste experience, every time. 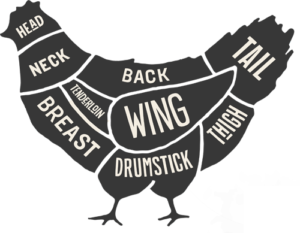 This means looking for sturdy breeds, with high levels of fat, because we believe it produces a better quality and tastier piece of meat when cooked. We’re committed to working with farming partners who have a passion for creating the best product as naturally as possible by utilizing the natural power of genetics. We feed our hogs a specialty vegetarian diet of prairie grains with no animal by-products, no additives, and no ractopamine. We source as much local feed as possible and work with expert nutritionists to develop a diet with human-grade feed ingredients so we can provide quality and consistency in the food we feed our animals. After all, you are what you eat. Our farming partners follow a strict set of Standard Operating Procedures that emphasizes food safety, quality and freshness to ensure we deliver uncompromised taste in accordance with Quality Assurance programs. LiberTerre hogs are proudly by multi-generational farming families who take the best traditions and mix them with modern farming techniques to provide seriously great tasting pork for you and your family. We balance great tasting pork with what is best for our hogs. That means, we never ever administer routine antibiotics or use feed antibiotics. Producing tender, tasty chicken and turkey starts with an underlying respect for animal welfare and an unwavering belief in humane care – from selection and breeding to transportation and processing. Our chickens and turkey are free to roam in barns and fed a nutritious whole grain diet. In our pursuit of seriously great taste, all LiberTerre poultry is raised without antibiotics. Our partners take care to ensure that the meat on your plate is always free from antibiotics. Our farming partners are proudly Canadian. LiberTerre chickens are raised on Quebec farms and LiberTerre turkeys from southwestern Ontario. Our delicious chicken is Halal Certified, ensuring the quality and safety of your chicken at every stage of processing. A Halal food certification means the flattened chicken you enjoy is not only fulfills Halal requirements, it also guarantees top notch sanitation, hygiene and unbeatable taste. Halal certification is just one of our many premium certifications. Ready to craft a custom protein program that helps you stay on top of changing customer needs? A simple 10-minute call can help you re-imagine your protein offering.